With the holidays quickly on its way and the amount of people travelling (today especially) and the sheer fact that I’m currently on a flight from Montreal to Las Vegas it just made sense to write about some natural alternatives then gravel. How many times have you taken gravel- passed out only to wake up in pain from sleeping in a compromised position, dry mouth chapped lips dry nose and static hair. .. Your that person that people get stuck next to and they can’t wake you up so they can go to the washroom because your so knocked out on meds. Well here is my list, travelling essentials to keep you in tip top shape to arrive and your destination energized, relaxed naturally. This is my natural guide to travel. The night before you travel or the morning of, prep your skin for the harsh dry air conditioning by nurturing it with a hydrating mask to replenish your skin, last night before my flight i used the thirsty mud by glam glow. Yves Rocher has a good one make from maple sap as well and is half the price. Once your skin is hydrated be sure to have a good nights rest and avoid coffee at all costs instead replace it with rooibos tea this tea is caffeine free but is very hydrating, and should hit the spot with its subtle aromas. Packing your cosmetic bag for your carry on is important, you need to have a hydration mist (my recipe for a cucumber aloe vera mist will be posted soon), hand moisturizer, disinfectant and moist toilettes, eye drops are also an essential, they will soothe the eye and help clear any redness. I also like to bring an under eye patch (i like Klorane Smoothing and Relaxing Patches with Soothing Cornflower )i don’t always use it on the flight but if i know i need to be somewhere right after landing its great to use an hour before landing to replenish the skin and help prep if you want to apply makeup. 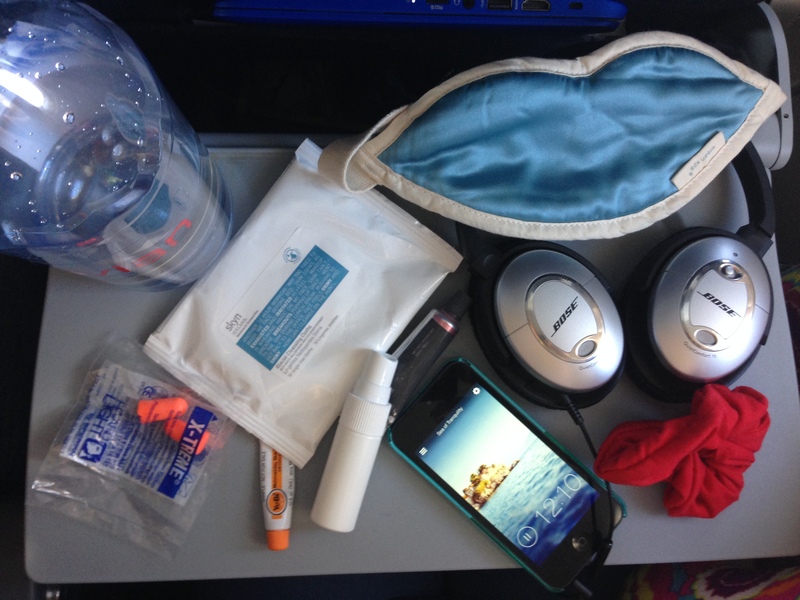 For my mental health i always bring ear plugs noise cancelling head phones (i cannot picture myself on a plane with out them), sleeping eye mask (my favourite is infused with lavender) and i swear by 2 meditation apps, calm and deep calm. Both provide you with soft background noises that take you away into paradise… On flights i cocoon my self into a tranquil oasis where i let myself be in a meditative state, this lets me be recharged and ready without jet lag for my trip. Finally at the airport once your waiting at the gate be sure to have one of two things, a reusable water canister so you can fill up water or purchase your self a bottle of water for your flight, although the flight attendants offer beverages you need to always make sure to drink water, i also like to buy some raw almonds or a bag of mixed nuts.